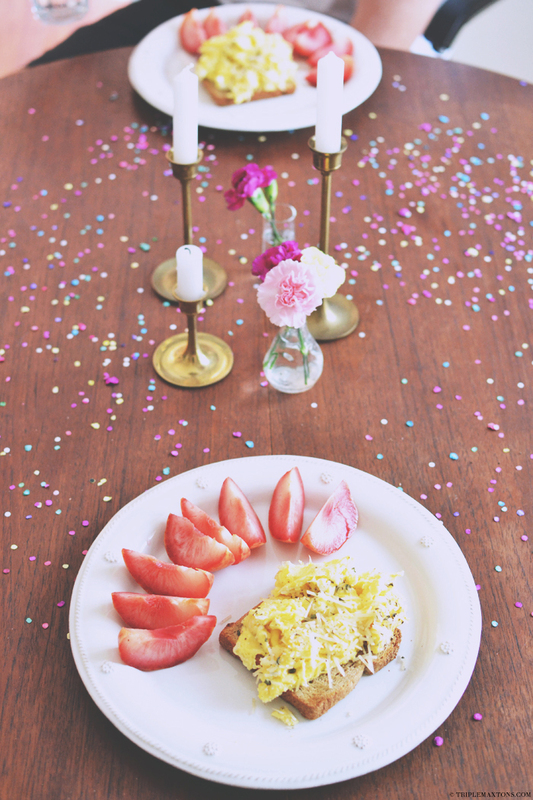 Photo from my birthday breakfast! Happy weekend, chickadees! I know it's been rather quiet up on this here blog lately, and well....I'm just feeling a bit overwhelmed and energy-zapped lately. Wanted to squeeze this post in since it's Friday, woohoo! This two day respite is certainly welcome. John and I are heading to a wedding on Saturday, followed by an all-day onion soup making session with my mom on Sunday. With a new-found and much-loved nip in the air (hooray for fall - finally! ), John and I have been craving some. Her onion soup is legit, y'all. Every other onion soup recipe is total and complete rubbish. I am not even exaggerating in the slightest. I've had a few failed attempts at making my own, so I'm going to study up while observing the master at work...and if y'all are lucky, I'll get the right techniques and share my mom's recipe that makes all other onion soup recipes pale in comparison. I also plan on wrapping up a few spray paint DIYs I have going on on Sunday while those onions get their caramelization on, framing pictures, planting our snake plant, and figuring out how in the heck to decorate our blasted dining room. It's an awkward unused eating/work/clutter collecting space...I have no freakin' clue what to do with it. We did hand curtains last week though, and....meh. Time to go down the black hole that is Pinterest and get a raging case of inspiration-hunting-turned-house-envy. I had the same problem with tomato soup, until I found the one on The Daily Muse. The good ones are so good, but why are there so many bad recipes out there? Boggles the mind. We are having a moving sale this weekend in hopes of getting rid of an entire room full of stuff that literally will not fit in our much smaller new apartment (not to mention to help finance the ridiculousness that is paying for and installing your own kitchen in Germany apartments). So, if anyone's interested in some designer dresses, bags and size 10/11 shoes, feel free to get in touch... ;) I can ship! I hope you post that recipe for the onion soup and share some before/after photos of your dining room-how fun! Things have been quiet on my blog too-I feel energy zapped too but it's all good work so no complaints right?